Smart phones, tablets and other mobile devices have become integral to how people work and collaborate today. So it shouldn't come as a surprise that the most-cited driver for mobile unified communications implementation was improving corporate collaboration, cited by 55% of TechTarget survey respondents. Although the market for mobile UC technology is growing, one of its challenges is that it puts a lot of pressure of connectivity, said Stephen Tong, senior director of infrastructure at Avanade. "While you can have a great client experience, if your connectivity's terrible, there's not a whole lot you can do. So there are limits to where [users] can go," he said. "But we do see situations where people are using mobile devices on Wi-Fi inside the campus environment and things like that, and that works just great." 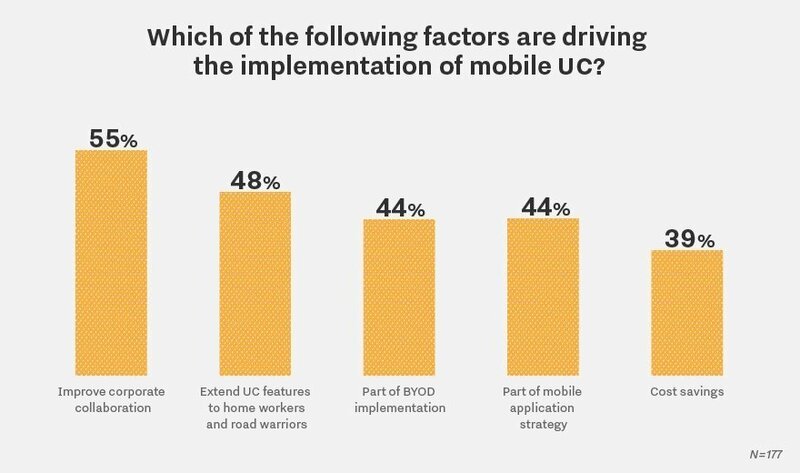 The next most-cited driver for mobile UC implementation was extending UC features to home workers and road warriors, selected by 48% of survey takers. This was followed by mobile UC implementation as either part of a BYOD implementation or mobile application strategy, cited by 44% respectively. What is the most challenging mobile UC implementation you've worked on?